The Three Rs: Rants, Raves and (Occasional) Reflections: Snow-M-G! Okay, I confess. I didn't come up with that title myself. I stole it from the weather segment on the Today show dealing with the storm that's currently dumping on the east coast. Here, we only got a small amount of snow, thankfully--but it hasn't been a great week for me, so even this little bit of the white stuff has been a headache. I've been dealing with a cold that just won't go away--at least I think it's a cold. There's been a lot of coughing and sneezing, too much congestion (I go through an average of two boxes of Puffs per day! ), fever and chills, all the stuff that goes with a nasty cold. Not sure what's causing the rash, though. Anyway, I'm not up for a regular post today, so I'm doing a short one with a photo taken Wednesday morning, right after the snow arrived.I took it right outside our door as Collin was leaving for work (the footprints are his). Note all the little bird footprints, all around our door. It got really gold. I think the guys wanted to come inside. Not the first time they've tried to get in. If property management would have allowed it, I would let them in! Hope wherever you are, you're safe and warm. 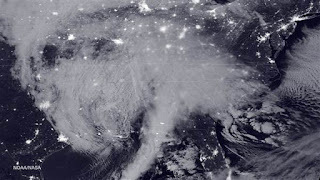 If you're on the east coast of the US, I'll be praying for you! I had a cold starting up before Christmas, and it's taken a month for me to feel better. It wouldn't surprise me if some newscasters are talking about preparing to eat the dead! Some of the photobloggers I follow around the Carolinas and Virginia have been talking about it. If they're getting as much as is forecast, it's going to be bad. For us, that kind of amount would be just another snowstorm. All those birdies know where the good people live! They know where the suckers are, that's for sure! Your comment about eating the dead made me think of a line from a TV show (2 Broke Girls) in reference to the world's worst birthday party: "The Donner Party had better food...."
Awwwwww what a sweet sight to see early in the morning. You are so lucky. I would have put some food out for them even if the managers don't like it..... maybe in the coroner ? But they have lived through this before so I guess they know what they are doing. Norma, get better soon ! They get food. Every morning. I just don't think she'd let me bring them inside. We have an old living room chair on our patio--Collin can't carry it to the dumpster by himself, so we have to get a hand truck or another pair of hands. The chair has skirting around the bottom. For as long as it's there, the birds can hide under it to get some relief from the cold. I just love bird foot prints! Hope you are feeling better, Norma. 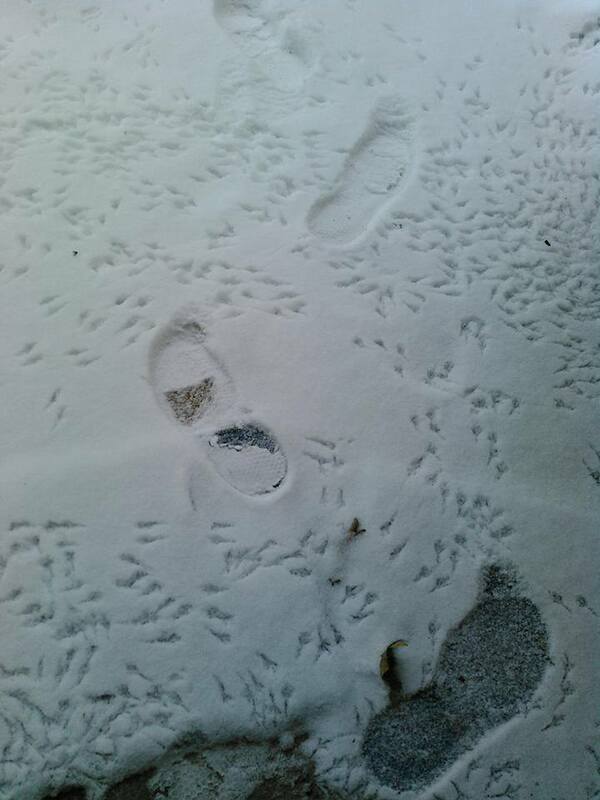 Every time it snows, we have bird footprints, Lynn. They know where the food comes from, so they've decided there are other necessities to be had here! We had a couple of blasts of bitterly cold temps, but rebounded. As of late, the snow has been nothing to report up here in northern ILL. I saw two pheasants in backyard the other day. Haven't seen them in a while. Good to see them rebounding from over-hunting. Hope you get better soon, Norma! Hope the rash isn't anything either. My doctor wasn't sure about the rash, so she gave me a referral to a dermatologist. I'm feeling better, except for the constant nose-blowing. Collin's off from work tomorrow, and I really want to go out then, so I figured it I stayed home all weekend, I'd be up for it. I'm guessing you HAVE been to see the doc Norma? This does not sound like your average cold Norma, especially not the fever part, that sounds like you could have a chest infection or something! Aunty Grace :) is going to be checking in a few days to make sure you have been checked out! I've had bronchitis before, so it's not exactly a surprise. I got it every winter until we switched to electric heat, but now that I'm older, I guess my immune system isn't what it used to be. Check in anytime, Auntie Grace! Poor Norma! This sounds like it needs to be checked out by the doctor! Especially with the rash! I've noticed I break out anywhere my skin comes into contact with our couch. We've had it a long time, but the rash is new. I guess now that my skin's drier, it's more sensitive to the not-so-soft fabric.